I’m not entirely sure why I have duplicate mailboxes on many of my email accounts that I use on my ios devices. But I do…and so does my husband and several friends. I suspect it has to do with how you setup the email account in Apple’s Settings – Email. It’s probably where you designate mailbox behaviors. I’ve discovered that IMAP email is actually quite complex in the way that it functions. I’ve tried to understand certain aspects, but really I only understand a very small portion of how IMAP email actually functions…and realized recently that I don’t really want to know more! I’ll leave it to the experts like my email server support department! 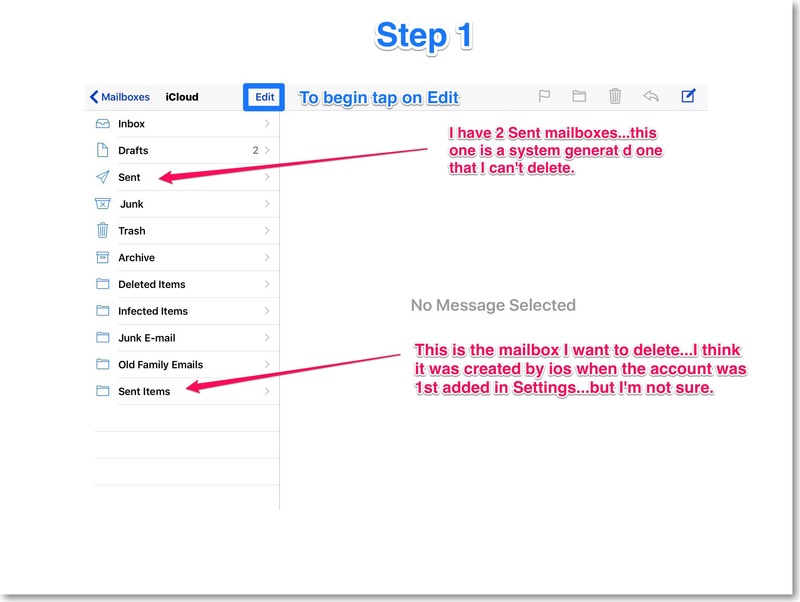 So the part I’m dealing with is how to fix it…how to get rid of the duplicate mailboxes. But of course, a little background information is necessary. Each year the email app gets a little boost in productivity. This year my favorite new feature is that when I move an email to another mailbox for archiving…the email app pulls up the correct notebook and suggests it before I can even leave that page to find it myself! This saves me a lot of time! With all my newfound time I spent a few minutes working on a never ending job…cleaning up my email accounts and their mailboxes! I have quite a few email accounts and I try to use automation as much as possible…but too inch automation can cause problems too. I learned that the hard way! While moving emails today I realized that I had a problem I kept ignoring…or I thought I must have been ignoring it. Because, it’s unlike me to leave unnecessary things lying around. Yet in each of my email accounts I had duplicates of several mailboxes. Yet the duplicates vary by the type of email account it is…for example Gmail accounts are different from straight vanilla IMAP accounts which are different from iCloud accounts. Regardless of the variety…the deletion steps are the same. I Bet That You Have Duplicate Mail Boxes Too That You Don’t Even Know About! 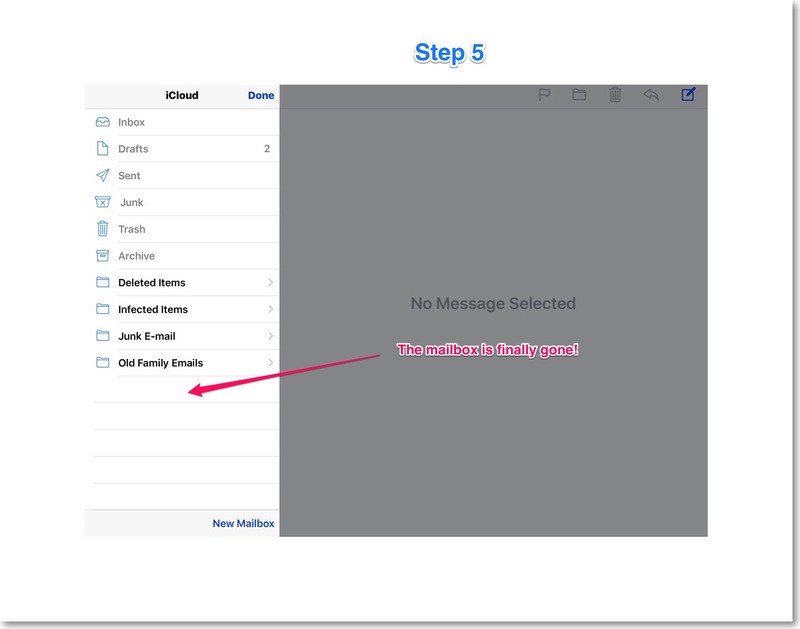 I’m adding this section because my husband just came home from work and claimed that he didn’t have any duplicate mailboxes on the one email account that he uses on his ios devices. He thought that my post didn’t pertain to him! I told him I was certain that he was wrong. We began to wager on our positions. I’m happy to report that he was wrong and I’m now the proud owner of one clean kitchen after dinner tonight! My husband actually had 2 duplicates on his Pop email account that he never even noticed! So, it’s very possible that you too have duplicate mailboxes that you don’t even know about! If you’re using Apple’s email app on an iPad or iPhone, I’m even willing to wager on it! You can tell the difference between system mailboxes and application ones by their icons. The system ones each have a unique icon related to their function. Application ones are always folder shaped. If you refer to the screenshot Step 1, you can see what I mean. These duplicates bother me for more reasons than that they are just plain unnecessary and they take up valuable real estate on my screen. Sometimes they can make it harder to find old emails…did you ever search sent emails knowing that you sent an email but couldn’t find it again? Well…if you have 2 Sent mailboxes on one email account…that could explain why! I just today realized today that this seemingly simple task is not that simple after all! Which is why I have these straight to book a mail boxes laying around. I remember now…I have tried to delete them in the past…but they just keep coming back! That’s because I didn’t actually delete them. Maybe I checked maybe I didn’t. But the mailboxes I had attempted to delete in the past were still there. I know this because I tried to delete them today and couldn’t. But remember I had that extra time today… so I was unusually persistent. When only one mailbox was successfully deleted on my standard vanilla IMAP account I decided to go to my iCloud account and to see if I could delete one there. Lo and behold I could! For some unexplainable reason I noticed that when I pressed on the word delete this time the ‘delete’ word flickered just a little bit…it was a very faint flicker. So I tried this with another email account that I rarely use but, for whatever reason, I still keep on my iPad (because there were no more mailboxes left to delete on the iCloud account.) I found that if I pressed harder on the word delete rather than just tapping on it…the mailbox successfully deleted! So, that’s the key to answering the question of how to delete unwanted mailboxes. Don’t tap on the word delete when you’re deleting a mailbox rather, long press on the word delete. 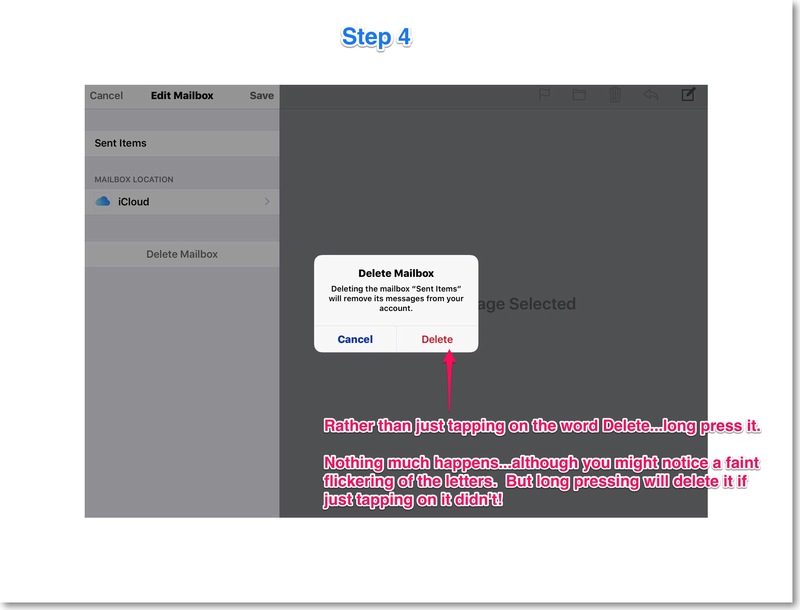 I illustrate the complete set of steps for deleting a mailbox in the annotated screenshots below. 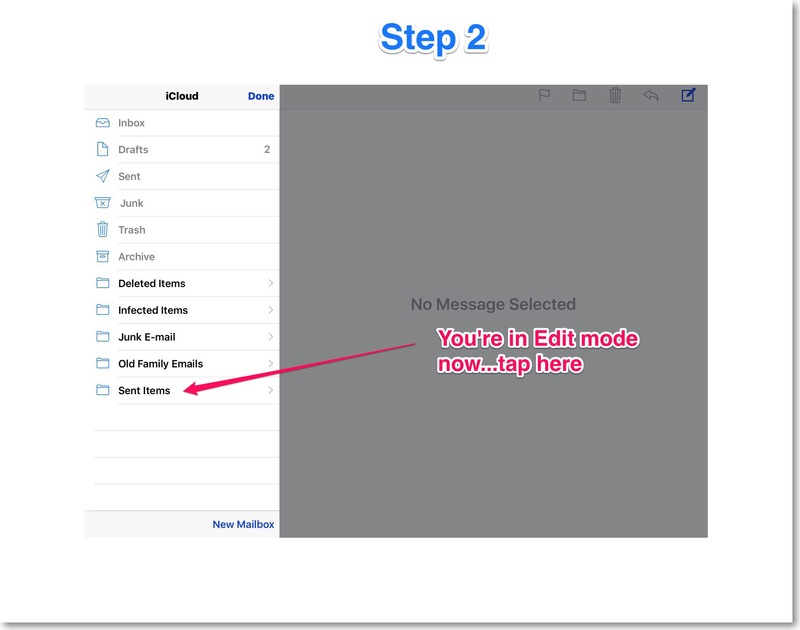 Begin in the email app where a list of all your mailboxes are displayed. 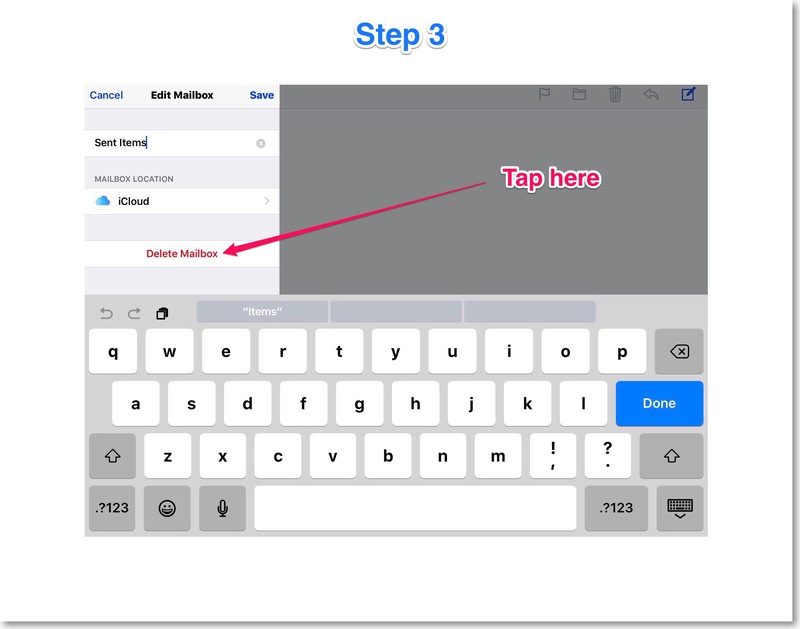 This entry was posted in ios, ios 9 Quick Tips, ios apps, iPad, iPhone and tagged Apple Email, can't delete mailbox, delete email mailbox iphone ipad, delete mailbox problem, Duplicate mailbox, email tip ios, ios 9, ios email. Bookmark the permalink. Sorry to take so long to reply. Your comment only appeared for me today which is weird. But I’m not entirely sure I understand your question. Two different icons for the same identical email program? Which email program is it and do you know how you came to have 2 different versions of it on your device? My guess would be it’s an older and newer version of the same program in which case deleting one shouldn’t impact the other. But knowing how they got there would be helpful. Thanks for taking the time to comment and good luck! I’m in this awful mess of too many comments that are spam ones and don’t think I ever replied to you…I’m so sorry. I’m sure you have your answer by now, but if you don’t here’s mine. 1. One is an older and one is a more recent version. 2. One is an iPad and one an iPhone version. In either case, deleting one app shouldn’t have any impact upon the one that remains. ios apps seem to be pretty self contained in that way. That’s part of what’s meant when you hear the term ‘sandbox’ applied to Apple products. They create these sandbox-like structures which inherently separate and protect your data.